Almost 3 months gone by in 2010 and I can finally cross another item off the list. I’m getting close to finishing some partials as well. Slowly i’m whittling down those 101 items. On to the list items! This was without a doubt the hardest list item I’ve done yet. (and one of the harder things i’ve done in a long time. 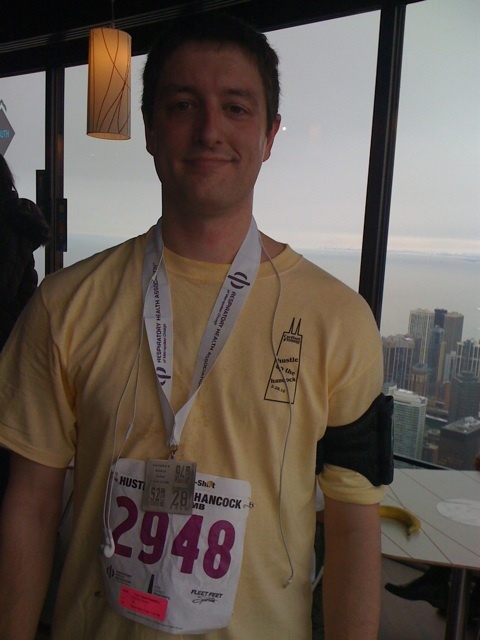 As most fellow list followers know, I participated in the Hustle Up the Hancock this year. I climbed 94 floors of what I’d like to call pure hell. You know it’s going to be rough when you can already feel it by floor 10. I was going strong until I got into the 70s. That’s when I had to really dig deep and kick it into high gear. I’m glad it’s done though. It was quite an accomplishment. My official time was 19 minutes, 57 seconds. (placing me 1081 out of just under 3000 people). Not too bad. This one was not as hard as I thought it would be. My newly dubbed “slow cooker Sundays” where I’ve been trying new recipes in the crock pot have left us with lots of leftovers. So I started taking those to work a lot more. The result? Not a whole lot of change really. I thought I’d feel healthier and such but I really didn’t feel any different. It was more just a hassle. It was harder to find things for lunch when I didn’t feel like bringing one. So I’m glad it’s done. MEH. So this is kind of a weird story. A week or so ago we went out for tapas with another couple. We decided to try a restaurant called Tango in Naperville. We got there and were seated pretty quickly. (for those not in the know, when you go for tapas you are basically ordering a lot of appetizers, so you eat in “waves”). The waiter took our drink order and we perused the menu. That’s when things got weird. Once we placed our first order of tapas, we sat back and relaxed. After a while about 30 minutes had gone by and we only saw our waiter once more (to give us a second round of bread). Another 15 minutes go by, no food, no waiters, no updates. Finally I grab a passing one and tell him to bring me another beer. He does and brings us another round of bread. At this point we’ve been waiting for our 1st round of tapas for 45 minutes. By now, we are getting pretty fed up and the lack of food and communication. We make a deal that if the food isn’t here by the time I finish my beer, we were out of there. Another 15 minutes go by and no food. So 1 hour to cook 4 small dishes (2 of which didn’t even need to be cooked). We said forget it. I threw down some cash for our 3 beers and we walked out. Fail Tango, big time Fail. We won’t be going back there again. Which leads me to our second restaurant, Bar Louie (also in Naperville). It now being 8pm on a saturday night in a crowded area, and we were pretty starving, we went to the closest place that could get us right in. Almost across the street was Bar Louie. We got seated right away. Ordered a round of beers, had a nacho appetizer, got our dinner and were out in 45 minutes. Now thats more like it. I had a BLTT (bacon, lettuce, turkey and tomato (which went to heather)). The food was great, the beer cold, and the wait staff really nice. I’d go back in a heart beat! This one is not too exciting. Me and heather played a game last week and she got to pick. Scrabble was chosen. I think you all know what scrabble is so I’ll skip the description. But it was a nice relaxed game, we didn’t even keep score. We were both tired so it was nice to just hang out. We even cheated a little because someone needed a letter or two she didn’t have (not mentioning any names). It was a fun time though. So all is well. So my friend Ryan bought a new mattress and box spring for his little offspring. Needing a way to get it home (and knowing he only has little cars) I offered the use of my Honda Element. So one rainy Saturday we drove out and picked it up. It’s a good thing too. Mr. Optimism thought he could fit it in his Honda Civic. It barely fit in the “elephant.” Hope your youngin’ is enjoying his new sleeping pad. And lastly my beer goal I must admit I’m sad to see this one done. My friend Ryan has been doing a great job of hooking me up with new brews to try. I’ve also been spending a good amount of time at my favorite restaurant, 2 brothers. So, on to the beers. First, from 2 brothers are their new year round offerings. Long Haul Ale and Resistance IPA. The Long Haul is probably one of my new favorite beers there. Its really, really good. The IPA was ok, but i’m not a huge IPA fan, so i wont hold it against them. I also managed to try a special offering they had. In very limited quantities, they had something called Cuvee Des Jacobins Rouge from Belgium. It was a very odd beer. Sweet and sour, tart and savory. It took about 3 sips to like it, but once i did, I thought it was really good. Next I tried my own creation. I have a Mr. Beer kit and I made the Octoberfest beer. It actually turned out pretty good. I’m glad i have a full case of it! 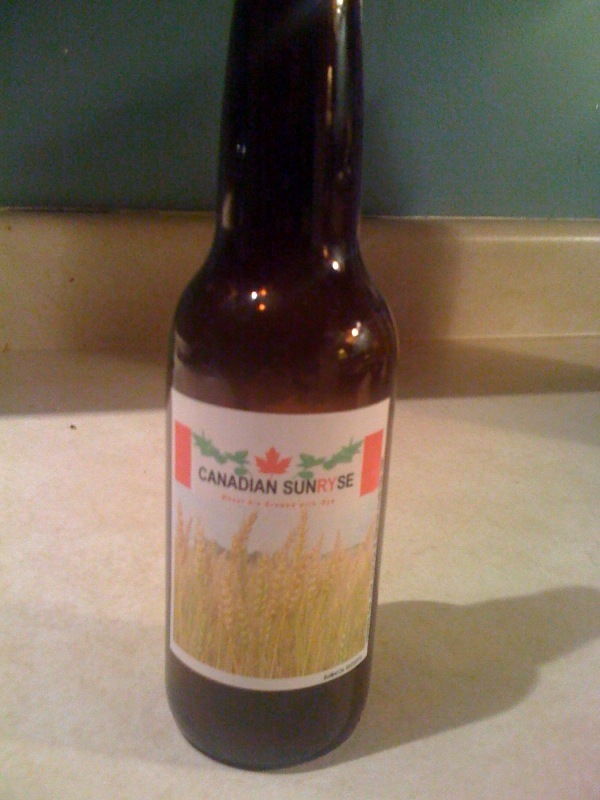 Lastly, I tried a beer called Canadian Sunryse. One of Ryan’s on home made beers. I think it turned out really good. I only got too bottles of it, so I’ll have to make it last (doubtful). I’ll have to smuggle a few bottles out next time I’m at his house.